Canopy Growth shares surged as the stock started trading on the New York Stock Exchange. 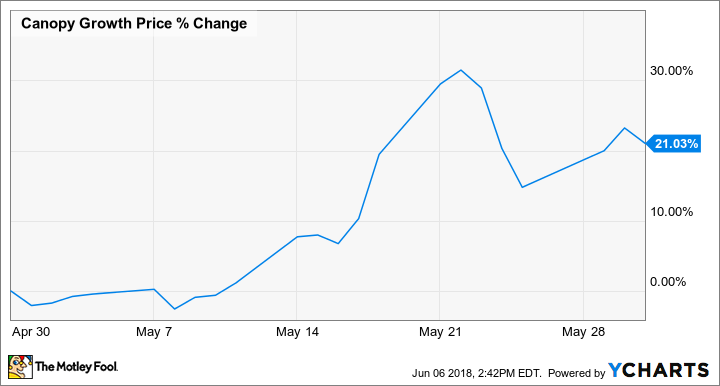 Shares of Canopy Growth Corporation (NYSE:CGC) were climbing last month after the company made an acquisition and it began trading on the New York Stock Exchange (a subsidiary of Intercontinental Exchange). Canopy Growth is the world's biggest marijuana company, and shares spiked 6.5% on May 14 as the company said it would get even bigger: It acquired the outstanding shares in the BC Tweed joint venture by buying the remaining 33% stake in the company. Management explained that "The consolidation of the two largest licensed cannabis facilities in the world into full Canopy Growth ownership cements the Company's commitment to shareholder value through scale production," and said it would pay for the purchase with $374 million in new stock. Also on May 14, Canopy announced that it had applied to be listed on the NYSE, and expected to begin trading on the exchange by the end of the month. Prior to that, its stock only traded on the Toronto Stock Exchange. In the days leading up to its May 24 debut on the NYSE, the stock surged 20%, but then sold off once trading began. Demand may not have been as hot as anticipated, or this could be an example of "buy the rumor, sell the news" investor psychology. Like all marijuana stocks, Canopy Growth is highly speculative; the company commands a market value of more than $6 billion, but has little in the way of financials to underpin it -- its revenue through the first three quarters of this fiscal year has been just $42 million. However, Canopy seems to be making all the right moves to consolidate its leadership in the emerging industry, and the tides in North America and elsewhere are shifting toward broader legalization of marijuana. Canopy's listing on the NYSE is a further sign of investor support, as is its strategic partnership with Constellation Brands. Already the stock is up 11% in June, as the company announced five new retail locations in Saskatchewan and said it would fund research into the role cannabis can play in addressing the opioid crisis. If things fall into place for investors, this stock could be a huge winner. It's already up nearly 1,000% since it went public in 2014.